F&N Homes of Bloomsburg Pennsylvania has been building top quality homes throughout central Pennsylvania for more than thirty years. For the past twenty-two years, F&N Homes has specialized exclusively in modular building. According to industry sources, the number of modular construction projects has more than doubled in the last ten years. There is increasing recognition that the modular building process provides superior construction and creative design at significant savings of cost and time. F&N Homes, a premium modular home builder in Pennsylvania, is proud to be part of this growing industry. 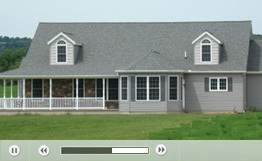 F&N Homes is a family owned business, operated by people who understand the needs of each individual customer. When you work with F&N Homes, you work directly with the company president, Scott Yorty, a certified modular home builder. Scott will guide you through the entire building process, from identifying costs, choosing a design and adding the finishing touches. We have the experience to ensure that every home is of the highest quality. We build homes using modules made by manufacturers that we know, have worked with for years, and trust completely. Our employees have an average of twenty years of construction experience. Our mission is simple: to help our customers realize the benefits of modular construction and to work with them to provide the right home at the right price. We know that every customer is different. We work with you to build the home you want. F&N has a wide variety of standard plans from different manufacturers which we can build “as is” or modify to meet your specifications. Or, bring us your plans and we will design a fully customized home that will incorporate all of the features, interior and exterior, that you desire. If you are considering building a home, consider the benefits of modular building. Send us a message or call us at 570-752-2440 to set up an appointment. Learn more about how you can turn your dream home into reality with quality, on time, and cost-effective modular construction.